A toy box bench adds an additional function to a piece of furniture essential to any child’s room. Bench styles range from elaborate to simple and usually have a low backrest and arms since they will be mostly used by children. Many standard toy box plans can be modified to include a bench by making the back and side panels taller to create a simple backrest and arms. 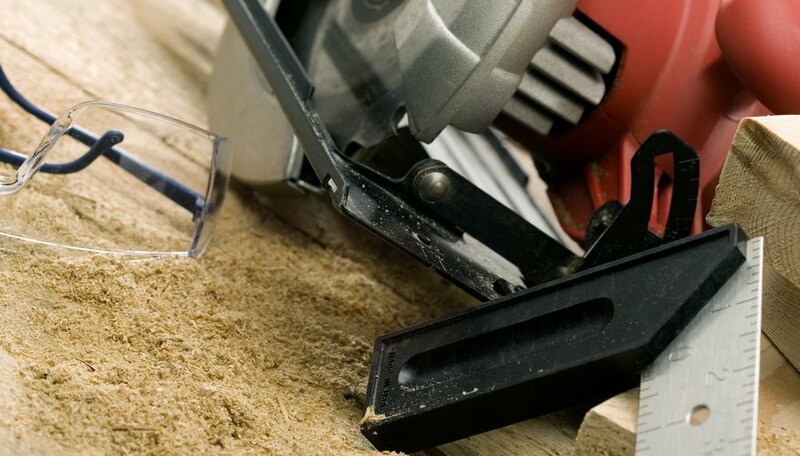 Purchase materials and have lumber yard cut wood into necessary pieces based on measurements provided. Using the pencil, draw a scalloped corner for each side so that the corners of the armrest are scalloped. Cut out the scalloped corner using the jigsaw. Using the tape measure, measure along the back edge and mark with a “1” one inch from the bottom and top of each side. From both marks measure three inches and mark with a “2”. From the bottom of each side measure eight and a half inches and mark with a “1”. From the top of each side measure seven and a half inches and mark with a “2”. Using the plate joiner, cut a groove about a quarter-inch from the edge for each set of markings on each side, with the joiner lined up in the center of the “1” and “2” marks. Match the grooves with the back piece and mark each groove on the edge of the wood. Using the plate joiner cut matching grooves into the edge of the back piece so that the edges of the sides and back lie flush when joined together. Measure along the bottom of each side piece and mark with a “1” one inch in from each side. From each “1” mark, measure three inches and mark with a “2”. From each side of the side pieces measure seven and a half inches, marking one measurement with a “1” and the other with a “2”. Cut grooves as before, cutting in the center of the “1” and “2” marks. Cut corresponding grooves in the edge of the bottom piece. Repeat the same measuring and cutting process along the bottom of the back and front pieces and the front edge of the side pieces, spacing the grooves evenly. Cut corresponding grooves into the edges of the bottom piece and the side edges of the front piece. Fill the slots on one side with glue and place a biscuit in each slot. Repeat the same process for the bottom edge of the front and back pieces. Fill each corresponding slot on the bottom piece and the edge of the front piece with glue and fit to the matching biscuit on the side, front or back piece. Repeat the same process to attach the opposite side. Clamp together and let dry. Drill pilot holes and attach seat cleats with glue and screws to the sides so that they are in line with top edge of the front piece. Using screws and the drill, attach half of the piano hinge to the edge of the lid piece. Attach the other half of the hinge to the inside of the box so that the hinge is perpendicular to the cleats. Attach lid support to cleats and connect the two pieces of the piano hinge. Round over all sharp edges with medium grit-sandpaper. Sand all surfaces with medium- to fine-grit sandpaper and paint.